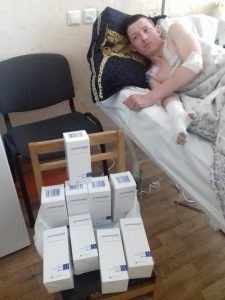 United Help Ukraine​ responded to an urgent request of purchasing antibiotics for a wounded soldier who was just transferred from the intensive care to a regular unit in a military hospital. Due to a large number of wounded soldiers recently admitted by the hospital, the hospital had to urgently make additional order of medication; however, due to the upcoming weekend and holidays, there was a concern that the order would not arrive on time. The supply UHU purchased for the soldier will last for the very important first 4-5 days (out of the 21-day course) and will help to avoid the imminent gap in supply. This entry was posted in Medical Supplies, Wounded Warrior and tagged hospitals, soldiers, wounded. Bookmark the permalink.